When you’re thinking about replacing your missing teeth, you have a lot of factors to consider. You have to weigh the risks and benefits of each option. You need to do some of your own research and talk to your dentist about which treatment is best for you. Of course, financial concerns also come into play. One tooth replacement option that some people dismiss due to monetary reasons is dental implants. Before you say no to them, however, you should consider both their cost and the long-term value they offer. 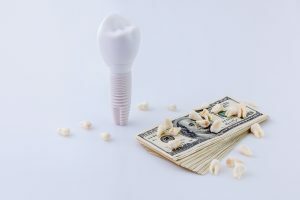 Your dentist in San Antonio is here to discuss how implants may affect your wallet and your oral health. The extent of any necessary preliminary work. Some patients require a bone graft or extractions before they’re able to receive implants. How many implants you need. Logically, a single-tooth replacement will cost much less than full-mouth reconstruction. Whether your insurance will help. Most dental insurance policies won’t help with the cost of implants, but a few do. Be sure to check with your coverage provider so you know if you’ll be responsible for all or just part of the cost of your procedure. Your dentist. Of course, different dentists charge different rates for placing implants and installing the restorations that go on top of them. In general, a single implant may cost anywhere from $1,000 to $3,000 or more. If you see any advertised prices that are lower than that, scrutinize the dentist’s credentials. You don’t want to entrust your smile to anyone who isn’t a true expert! Implants have the potential to last a lifetime. A bridge may last just 10 to 15 years, and dentures might last only five to eight years. In the long run, it’s possible that implants may end up costing you less than other options because you’ll never have to worry about replacing them. A very high success rate. The success rate for implants is over 95 percent. Bone health benefits. Implants act like natural tooth roots, so they help to fortify your jaw and prevent the bone loss that normally comes with missing teeth. No other tooth replacement method can do that. Ready to replace your missing teeth? If you find room in your budget for dental implants, you can look forward to many years of healthy smiles. Drs. Troy Jones and George Knight work together in our San Antonio office to help their patients enjoy excellent oral health. Dr. Jones is even a member of the International Team for Implantology, so you know you can trust him to replace your missing teeth. If you have questions about dental implants, please contact us so we can talk about giving you back the smile you’ve been missing.